The School by Jaya One (The School) joins forces with KakiDIY to launch its first-ever MakerLAB, an upcycling makerspace that encourages learning, creation, innovation and invention using available resources. This makerspace will act as a hub, gathering creative, curious people who enjoy learning and sharing what they love to do. MakerLAB is The School’s maiden effort at developing its enrichment offering for children and youth ages 6 to 16. in the coming months, a succession of education and extracurricular providers will join MakerLAB on the first floor of The School, providing youths with the avenue to explore the sciences. ”We want to initiate the first step and take STEM (science, technology, engineering and mathematics) to the next level. MakerLAB will be a hub for all young entrepreneurs, scientist, crafters, engineers and artists to create and innovate. The world is all about moving towards renewable energy, and The School wants to do its part in enriching the younger generation in the aspect of environmental awareness,” said Charles Wong, Executive Director of Tetap Tiara Sdn Bhd, the developer of The School by Jaya One. Spearheaded by KakiDIY, a leading community on the Maker’s Movement in Malaysia, makers can carry out classes and workshops ranging from arts and craft, STEM, Coding, Electronics, Woodcrafts, Pottery, Sewing, 3D Printing and more. The space is equipped with classroom space, a workshop area, worktops, ample flooring, good lighting and ventilation. Additionally, the workshop area is furnished with electronic tools, handheld power tools and 3D printers. The MakerLAB is a joint collaboration between KakiDIY and The School by Jaya One. "The three main excuses of the public when it comes to DIY (Do-It-Yourself), repairs and making things are ‘no space’, ‘no tools’ and ‘no experience’. Hence makerspaces are the perfect solutions to this problem. As The School is an enrichment mall, it is the right place to host the like-minded MakerLAB here," said Johnson Lam, the founder of KakiDIY. MakerLAB is the first phase to create an upcycling culture amongst youth. With its current space of 3000 to 5000 sq ft, The School and KakiDIY will take this initiative to the second phase, which is to build an Environmental Control Lab in the coming months for the greater purpose of saving our mother nature. Towards this noble cause, The School will be home to all Mini Maker Faire in the Klang Valley in the future. 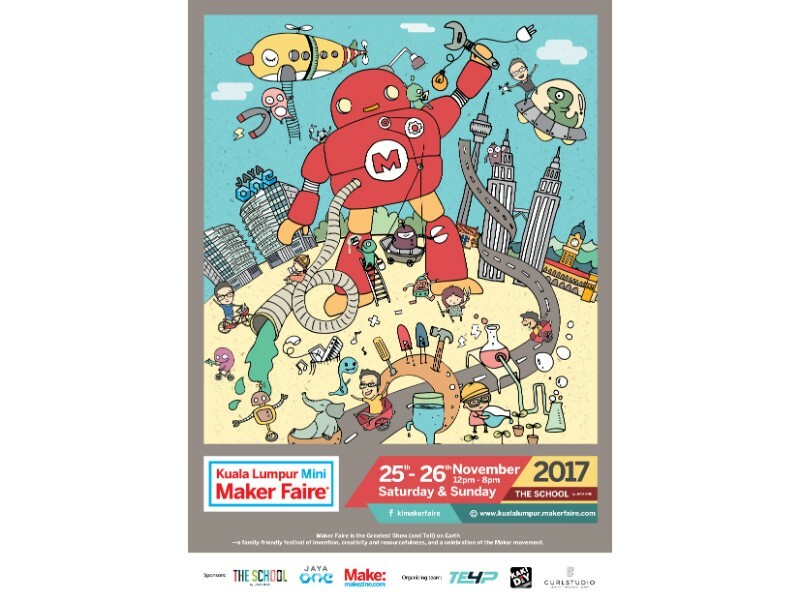 Following the prominent launch of the MakerLAB, Mini Maker Faire will be held in KL for the first time on the 25 and 26 of November - to celebrate arts, crafts, engineering, science projects and the DIY culture. Hosted by The School and KakiDIY, the festival is licensed by Makezine and supported by TEfourP Enterprise, PCBWay, Dremel Malaysia and Gurl Studio. The event will have approximately 80 booths showcasing maker's exhibitions, maker's retail products as well as workshops, amongst others. Guests are encouraged to explore the experiential zones – namely Art Zone, Tech & Electronics Zone, Science Zone, Hands On Zone and Workshop/Talk Zone. The two-day festival will also feature a great deal of hands-on activities for budding and experienced makers, such as String Art, Tangram Puzzles, Slime Making, Origami Building, DIY Hologram, LED Throwies, Ice Cream Stick Photo Frame Making, Paper Helicopter Making and many more. There will also be a Demo and Drone Experience booth on the first floor of The School, Jaya One. Additionally, attendees can look forward to a host of exciting workshops, most notably the Making of Storm Trooper Helmet, Lightsaber, 3D Printing, Augmented Reality (AR) / Virtual Reality (VR), Soldering and Repair coached by the KakiDIY community. To further cultivate the younger generation in arts and science, there will be talks revolving around the theme of Science, Drone, Robots and Makers’ experience at the main stage.